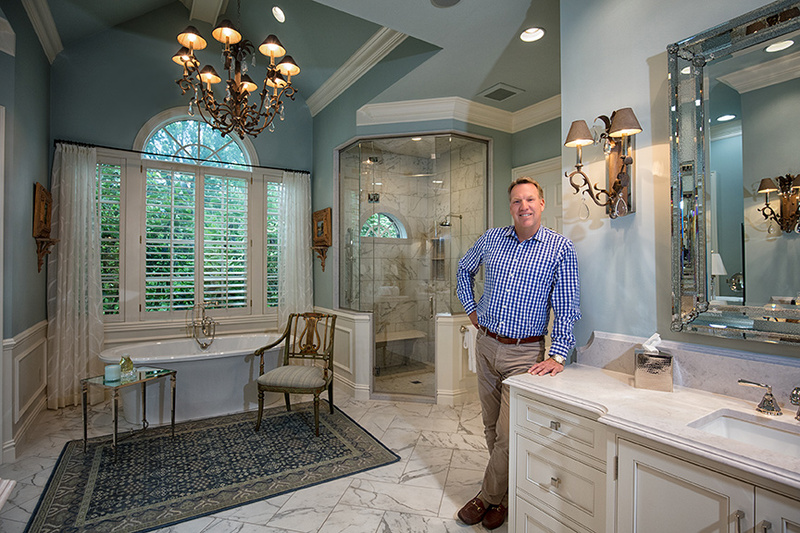 Bob Burmeister shares tips for making your bathroom into a luxurious sanctuary. SLHL: What are some creative ways homeowners can make their bathroom unique? Bob: New styles are calling for cleaner looks with freestanding pedestal tubs, oversized showers with multiple showerheads, body sprays and rain showers. SLHL: Should the cabinetry in each of your bathrooms match or complement one another? Bob: Every designer views that differently. I prefer each bathroom to take on its own identity. I tend to design styles that complement the users' wants and wishes, while still keeping them functional and aesthetically pleasing. SLHL: What should you think about when choosing your tile in relation to your cabinetry? Bob: Tile should be the first choice since there are often so many tiles in a bathroom. There is commonly tile on floors, showers, wainscot walls, base moldings and even window casings. I like to sketch up an initial look, and then consider tile colors and finishes such as glass, marble or porcelains. Once the tile is selected, I design a nice cabinet that complements the tile. Throw in the perfect quartz countertop, and your bathroom has a style of its own. SLHL: How do you decide between doors and drawers for bathroom cabinetry? Bob: I don’t think deciding between them is as important as what you’re going to store inside them. Some of the nicest bathrooms I’ve done lately just have wide, deep drawers capable of storing the largest of towels, hair dryers and curling irons, but I can also divide a top drawer into different levels to allow organization of make-up, dental hygiene and hair grooming items. And whether we choose doors or drawers, installing electrical outlets inside the cabinet eliminates all of those tangled electrical cords running across your vanity tops. SLHL: What should homeowners think about in terms of cabinetry design for aging in place? Bob: When designing for aging in place, I need to plan on wheelchair accessibility to sinks and showers, as well as turn-around floor space and reachable wall cabinet storage. We usually have limited base cabinetry in these designs. SLHL: Should handicap accessible be a priority when remodeling your bathroom for resale value? Bob: I think this is something that should be considered when looking at the entire layout of the home. If your house is a ranch with few or no steps, then accessibility may be something that would be wise to incorporate. SLHL: What is the coolest trend in bathrooms now? Bob: Definitely the freestanding pedestal tubs. But follow that up with an oversized steam shower with a heated seat, and you have a winner.